Lobsang Phunstok is sort of the Father Flanagan of Tibetan Buddhism. At the foot of the Indian Himalayas, he founded Jamtse Gatsal, or “The Garden of Love and Compassion,” an orphanage and school for abandoned children. He might be a former Buddhist monk, but he has the patience of a saint when it comes to difficult children like Tashi Drolma. However, you have to feel for the five year old, considering how much she has already faced up to in her young life. Lobsang Phunstok and his staff will help her find her place in Jamtse Gatsal and start to heal her trauma in Andrew Hinton & Johnny Burke’s Tashi and the Monk (trailer here), which premieres this coming Monday on HBO. Drolma’s alcoholic father abandoned her sometime after her mother died at a tragically young age. That is more than any kid should have to deal with, so it is hardly surprising her behavior tends towards the aggressive. There is no question she is disruptive, but when you hear her make-up revealing stories about little girls just like her that are haunted by ghosts, it is easy to see she is hurting. Lobsang Phunstok understands only too well. He was also abandoned during childhood. That is why he will not give up on a trouble-maker like Drolma, even while he wrestles with difficult administrative dilemmas, especially his admissions process. Clocking in well under an hour, T&M is comparatively brief, but it pummels viewers’ heartstrings. The disarmingly innocent looking Drolma will activate every protective instinct the audience might have, so it is rewarding to see her finally settle in, thanks in large measure to Raju, her “big brother.” However, the film also makes it painfully clear the good monk simply cannot save every child in need, showing us the tragic consequences for one child he was unable to admit. We often think of Tibetan Buddhist monasteries as exotic places of spiritual sequestration. In contrast, T&M and Frederick Marx’s Journey to Zanskar paint a dynamic portrait of Tibet Buddhism as an activist faith, very much engaged with the welfare of the young and desperately disadvantaged. Both documentaries capture deeply moving human stories, while acting as a corrective to Lost Horizon-style exoticism. After watching T&M for forty-some minutes, you will ardently care about what happens to both Tashi and her guardian. Hinton & Burke also have a good eye for visuals, giving viewers a vivid sense of the stunning Himalayan environs. It is a truly inspirational film that never feels saccharine or manipulative. 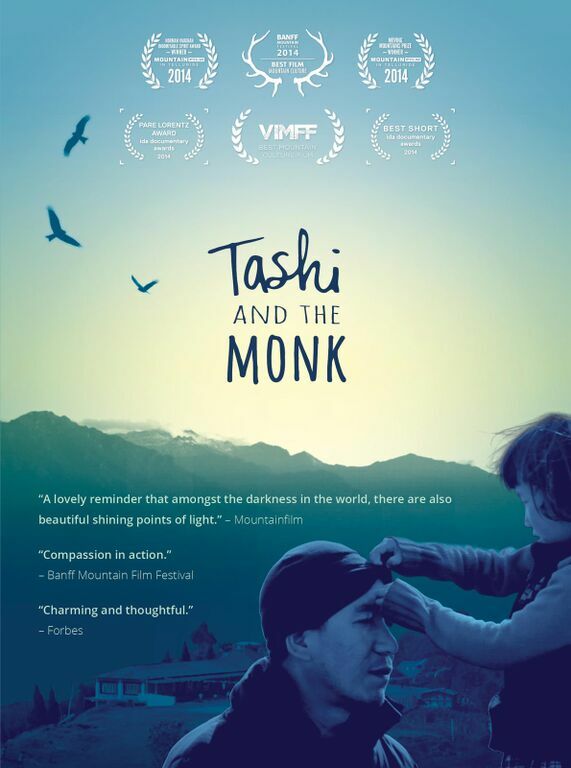 Highly recommended for those interested in Himalayan culture and faith in action, Tashi and the Monk airs this Monday (8/17) on HBO.